The final hurdle to jump on the path to becoming a teacher in Georgia is passing the Georgia Assessment for the Certification of Educators (GACE) exam. Everyone from the 20 year teaching vet moving states to the new college graduate has to have a plan for passing the exam. The GACE is different than other state certification tests, and since it costs a pretty penny to take, it seems worth it for test takers to invest in a high quality study guide book. Unfortunately, there are many GACE study guides on the market that over promise and under deliver when it comes to helping you pass the GACE. The same can be said for the GACE practice tests inside those prep books. This article will help you make the most of your studying and avoid making a costly mistake with your precious time and money. We analyzed real reviews from websites like Amazon to give you practical advice about GACE study guide books. Our research found that study guide books had content and practice materials that were not on the test and despite the money spent did not help test takers pass the exam. Reviews of the most popular study guides made the point that there wasn’t much guiding going on inside of the pages because the authors did not include enough examples or descriptions for how to solve test questions. The study guides often had pages and pages of content that was disorganized without basic parts such as an index or glossary. How do publishers get away with producing such a poor product? After all, why pay money for something you can do better yourself? Problem #1: The study guide format and content does not match the GACE exam. The study guide books on the market are a joke. They are mass produced by publishers who spend more time writing their product descriptions than they do their study guide materials. It is truly sad that people using these study guides eventually failed their GACE exams even though they put the time, effort, and money into their preparation because the format and content of the study guide did not match the actual test. It is a major problem when a study guide book includes topics that are not listed in the GACE test framework and leaves out ones that are. You could know the study guide like the back of your hand yet walk into the test and feel like you knew nothing. What a waste of time and money! Thankfully, you can download a free study companion from the official GACE website to start your studying on the right foot. The free study companion gives you a breakdown of the proportion of each objective on the test. This is critical information to begin your studying with because you cannot rely on the content in the study guide books to accurately represent how the GACE exam will be tested. It is up to you to learn what objectives are most likely to be represented on the test and prioritize your studying in proportion of how often they will appear in the exam. One way to familiarize and learn the format and structure of the test using the free study companion is to mind map the content areas and objectives. A mind map is a visual representation of dumping the knowledge you already have into a format that is easy for the brain to remember. For example, if you are studying for the high school mathematics test you can begin with writing Subarea 1 – Number and Quantity 30% with a circle around it to represent how frequently you can expect this concept to show up on the exam. Then draw wavy lines from the center to the outer edges of the page and summarize each objective in your own words. Then attach another wavy line from the objective to tell yourself where you can access resources for this topic (e.g. college notes, khan academy, YouTube). By the end of this mind mapping process you will have familiarized yourself with the content and structure of the course and built an outline of how to study for the exam. Problem #2: There are not enough examples for how to solve problems. How can a study guide claim to help you pass an exam and have no worked examples to follow? The biggest sin a study guide can make is to only give examples of topics with the answers but then absolutely no work-out to provide direction as to how they arrived at the given answer. It’s as if the authors expect you to memorize the question and answer because it is verbatim from the GACE. Most guides fail to give you all of the steps and assume you will know how they got to the answer, but if you are just learning or relearning these concepts, seeing all of the steps is vital. If you can’t rely on expensive study guides, then where else can you turn for step-by-step help on questions likely to asked on the GACE test? New technologies such as www.wolframalpha.com, a computational intelligence platform allow users like you to ask a question and receive solutions that include step-by-step details. You can register as a free user and ask a range of questions from math to art and from physics to history. Leveraging technology is another way to triangulate questions and answers so that you have confidence that what you are learning will help you pass the GACE exam. Test out the process by checking the answer to a question you already know, so that you can become familiar with the style of the output. Problem #3: Study guides are too wordy and some lack basic organization like a glossary or index. Study guides try and justify their expensive prices by adding way more info in the book than what you will actually be tested on. In fact, some do not have much of anything in their guides that is actually on the test, and others read like summary notes of random subject knowledge. Even though you can’t trust the study guide authors to craft an organized companion to the GACE test, by following these four steps, you can create your own personalized study guide. 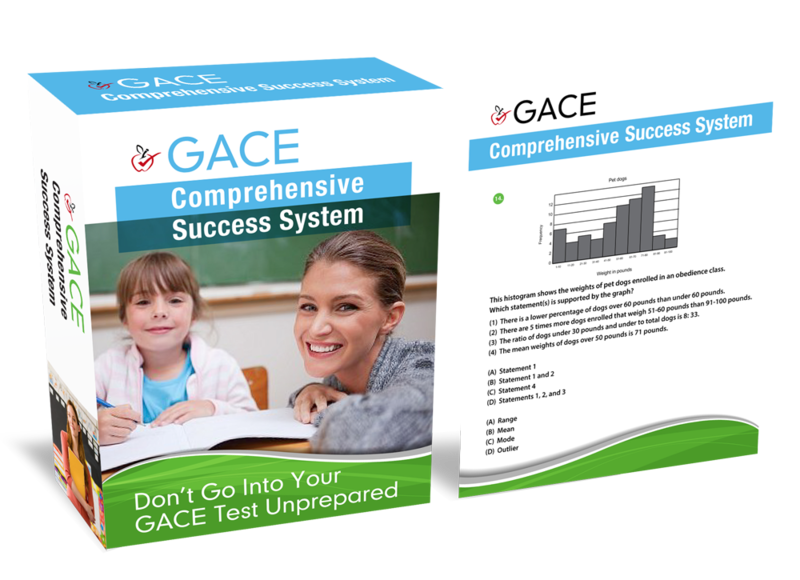 STEP 1: Take the free practice test in the GACE study companion. You can download a copy from the official GACE website. STEP 2: Rate each question on a scale of 1 to 3, 1 being easy, 2 being somewhat difficult, and 3 being difficult. STEP 3: Create a table from the GACE objectives. Make each line represent an objective. Then re-read the practice test questions and categorize them into the table according to the objective you think it best belongs to. This process will go a long way towards helping you understand exactly what you will be tested on. STEP 4: Look at the table and find the objectives with the most questions you rated as 2 – somewhat difficult and 3 – difficult. Start your test preparation by focusing on these objectives first. Downloading the GACE Study Companion from the official website and mind mapping the content areas and objectives. Sign up for free websites like www.wolframalpha.com to get step-by-step instructions and solutions to questions and content that you need help with. Take the free GACE practice test and start the process of creating your own personalized study guide. You will sprint to the finish line in record time because of yours personalized preparation. Expensive study guides for sale on Amazon do not deliver the same results and put you at risk of failing the GACE and losing your money.